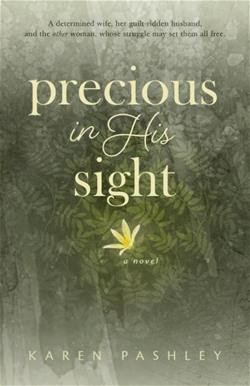 I was blown away by Karen Pashley's new novel Precious in His Sight. This novel is set in the south and has a bit of that southern charm. When I first started reading this book I didn't think I was going to enjoy it as a few of the southern cliches littered the pages. I kept going and about 8 pages into reading I couldn't put it down. That is saying a lot for this sleep deprived MOM! The story features subjects that Christian novels really don't tackle - adultery and abortion. In fact the thing I liked most about this novel was how real it felt. The characters were so well developed that you could feel their struggles with sin and God. You wanted to see them grow and cope with all that was going on in their lives and achieve victory. While this book is fiction it really had a strong message about how God moves in our lives. We can't always choose the circumstances but we can always choose how we react. I felt like that was a great hidden message in this book. While the end of the story seemed predictable Pashley throws us a curve-ball at the end. I think it fit well with the story and helped to further stretch the characters. The main character Sugar is a woman of integrity and great faith. She gives grace and love - something we could all learn to do more. Phew! That was a lot from me! I really enjoyed this book. The nitty gritty (not graphic in any way!) of adultery is hardly ever touched and I think it is something that authors in this genre shouldn't shy away from. I'm thrilled with the pro-life stance and I hope that this book's plot of unfortunate circumstances might actually bless someone going through similar challenges. All that to say - this is a great book with a fantastic story. You'll have trouble putting this one down - just like I did! What does it mean to fully surrender to God? In Westfield, South Carolina, where wealth andprestige go hand-in-hand with sippin' sweet tea and servin' Jesus, successfularchitect Clay Brennan and his adoring wife Sugar enjoy the American dream. When strong-willed Sugar discovers that Clay ischeating, she keeps it to herself. Exposing his secret would destroy theirkids' respect--ruin their stellar reputations. Though her heart is crushed, she longs to repairthe damage. But trusting God to heal the deep wounds proves more difficult thanshe'd imagined. Amidst the anger of betrayal, the humility ofbeing transparent, and the anguish of life's unfairness, Sugar Brennan learnsthat the gift of God's grace means little, unless she's willing to give itaway. The novel’s heroine – Sugar Brennan – is especially close to Pashley’s heart. As Pashley describes it, Sugar has been bombarded with messages her whole life about what it means to be an upstanding southern Christian woman. Brought up in the church, married to a successful businessman, Sugar invested a tremendous amount of energy into fulfilling that image. Pashley wanted to explore how her strong-willed, yet adorably-flawed protagonist might react when faced with a devastating moral crisis. While writing the early drafts, Pashley says she would lie awake at night wondering how she would handle Sugar’s situation, and how God could turn something awful into something beautiful. And like Sugar, Pashley has experienced her own personal moments when she wasn’t sure what God was thinking. One lucky reader will win a copy of Precious in His Sight! I would love to read this. Looks like a great book! Love to read this books looks like a good read! bit more than just your articles? I mean, what you say iss valuable and all. with pics and videos, this site could definitely be one of the most beneficial in its niche. No deseo un amor perfecto , Solo te quiero a ti.